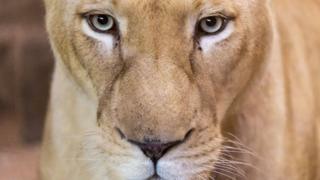 Horse owners in Denmark face a six-month wait if they want to feed their recently deceased equines to the lions. It's become so popular to donate the carcass of your dead horse to Copenhagen Zoo as food for its carnivores that there's now a waiting list, Denmark's TV2 reports. Given the choice between having your deceased animal collected and recycled by a private company for a fee of up to 3,700 krone ($584; £443), more owners are looking into the "cheaper and more natural" option of zoo donation, the TV says. The zoo alternative is free, the Copenhagen Post notes, and owners find their service more comforting than the thought of their beloved animal becoming biodiesel and meatballs. "When the horse is eaten by lions, it is part of the food chain," horse owner Karina Fisker says. She said it was important to her that her horse Vorning Hestepension didn't suffer any distress. "The horses are our one and everything. It's all very emotional," she told TV2. The zoo's press office says that the waiting list tends to expand in the autumn after owners give their horses "one last summer in the pasture". But horse meat is only part of the diet for Copenhagen Zoo's lions, tigers and brown bears. "They eat a lot of horsemeat, but they also vary their diet with rabbits, calves and a single goat or zebra every now and then," the zoo's Jacob Munkholm Hoeck says.